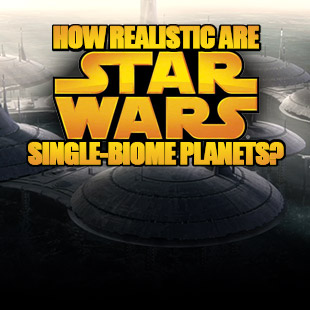 Star Wars Canon: Just How Realistic Are the Single-Biome Planets? Fiction loves dropping our favorite characters on to single-biome planets, that is a world with only one predominant ecosystem whether it be all tundra, all jungle or all under water. The science, sadly, doesn't always match up. Earth's diversity of landscapes and ecosystems is no accident, but rather the result of the evolution of a living world. If a planet is to be defined by a single biome, then it needs to hold up to scrutiny. Today we'll take a look at some of pop culture's most well-known single biome worlds and see just how realistic they are. To fill in some missing information, we'll be drawing upon the Star Wars Expanded Universe -- that is, the collected knowledge of all officially licensed background information outside of the six feature films, much of which has been catalogued in Wookieepedia. After all, Luke Skywalker traveled from the desert planet of Tatooine, to the ice planet of Hoth, to the murky swamp world of Dagobah.